Heather started as a hairdresser in 1995, attracted by the creativity and diversity of the profession. She enjoys the different challenges each day brings, from highlighting and cutting to makeup application and updo work for wedding parties. 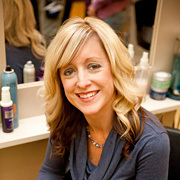 A person who thrives on the changing dynamics of the industry, Heather loves to create the latest styles and techniques for her clients.